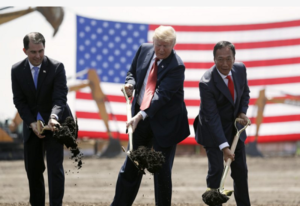 MADISON, Wis. (AP) — Foxconn Technology Group said Wednesday it is shifting the focus of its planned $10 billion Wisconsin campus away from blue-collar manufacturing to a research hub, while insisting it remains committed to creating 13,000 jobs as promised. to return manufacturing to the Midwest and the United States. Foxconn, a major supplier to Apple, is the world’s largest contract maker of electronics and China’s largest private employer. The Taiwan-based company billed the massive 20 million-square-foot Wisconsin campus as its first North American manufacturing site for the next generation of liquid crystal display panels to be used in a wide variety of products, including large-screen TVs, self-driving cars, notebooks and other monitors.